Then the 2.0-Liter turbocharged engine wrapped in a red engine cover should get your blood pumping. After all, the Type R spits out 306 horsepower and 295 pound-feet of torque. Rediscover your passion for motoring behind the wheel of this new machine from Hodna. The center-mounted, triple outlet exhaust will billow a throaty grunt to let everybody know you were there. This car is designed to look fast and drive faster. Styling elements are highlighted by an aggressive front end, vicious profile, and bold sign-off. Visit Premier Honda in New Orleans, Louisiana to find your Civic now! Of your audio, technology, and the road. The Civic Type R is designed for the road and the track with drive modes for each scenario. When you take control of the track, track your performance with custom digital displays to measure lap times, G-force, and more. When you're cruising around town, the Sport and Comfort modes will refine the throttle response, tune the suspension, and adjust the steering inputs to your desired setting. The next time you road trip from New Orleans to Nürburgring, you'll be king of the green hell. Along with its guttural roar, the new Civic Type R offers a premium audio experience inside the cabin as well. The 7-inch touch-screen gives you command over the 540-watt, 12-speaker sound system. Activate your standard Apple CarPlay™ and navigate your favorite podcasts, music, audiobooks and more. Open the maps for step-by-step directions to the racetrack near Metairie and Kenner. Want to know what the weather will be like when you get there? Turn on your Android Auto™ Integration. If you are ready to upgrade your current Honda lease deal, you've picked an ideal time to discover the Civic Type R. This new Honda is now available at our new and used car dealership. 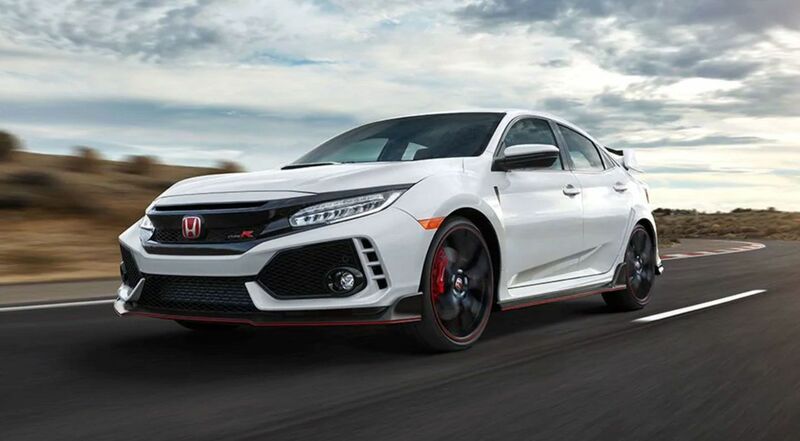 Visit Premier Honda for a test drive of the new Civic Type R and enjoy the race-inspired performance, connected audio options, and aggressive design. Be sure to discover how you can customize your Honda with accessories like a carbon fiber wing spoiler. It is motivated by an in-line 4-cylinder engine. The turbocharger puts out 23.2 psi of boost to generate 306 horsepower at 6500 rpm. This 1996 cc engine redlines at 7,000 rpm with max torque of 295 lb-ft between 2500-4500 rpm. This powerplant mates to a 6-Speed Manual Transmission with Rev-Match Control for an impressive 0-60 time. Notable styling elements include the wing spoiler, center-mounted, triple outlet exhaust, and LED fog lights. In addition to the carbon fiber rear wing, there are notes of carbon fiber inside and out. The cover of the door mirror is topped with carbon fiber for a racing-inspired look. There are trim pieces on the dash and center console of carbon fiber that accent the red leather-wrapped shift knob. An illuminated door sill trim protects your Type R from scuff marks while completing the interior. The next time you carry tools or spare tires to the track you'll be glad you have the Type R cargo tray in the trunk to protect the carpeting from grease and grime.